2: Recent FLASH Upgrades . 6: Meetings and Seminars . 8: Beamtime Request Study Weeks . 11: TESLA Technology Collaboration . 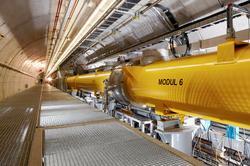 FLASH, the world's first soft X-ray free-electron laser (FEL), is available to the photon science user community for experiments since 2005. Ultra-short X-ray pulses shorter than 30 femtoseconds are produced using the SASE process. SASE is an abbreviation for Self-Amplified Spontaneous Emission. The SASE or FEL radiation has similar properties than optical laser beams: it is transversely coherent and can be focused to tiny spots with an irradiance exceeding 1016 W/cm2. 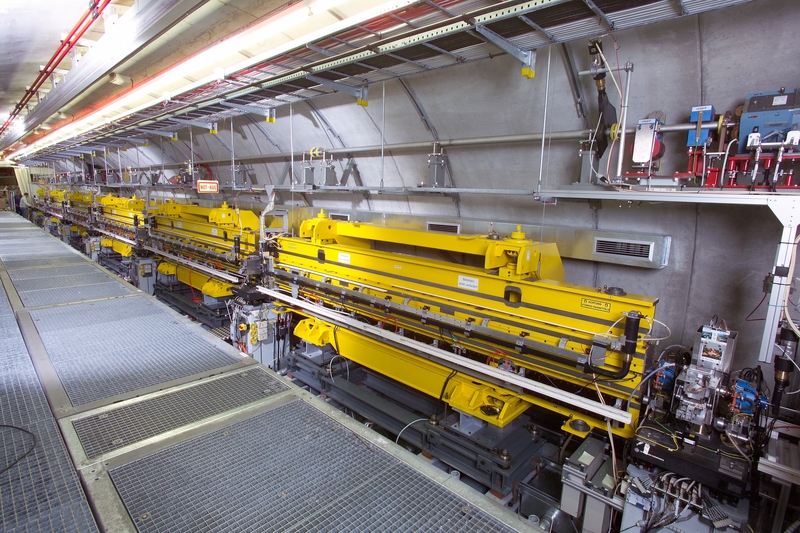 The FLASH facility operates two SASE beamlines in parallel: FLASH1 and FLASH2. The electron pulses of FLASH come in bursts of several hundred pulses with a repetition rate of 10 Hz. The pulses of a burst are shared between the two beamlines providing FEL radiation for two experiments at the same time - with the full repetition rate of 10 Hz. A third beamline for plasma acceleration experiments (FLASHForward) is in preparation. The aerial view shows the FLASH facility with its two experimental halls "Kai Siegbahn" and "Albert Einstein" (August 2015). The SASE process is driven by high brightness electron beams. At FLASH1, the wavelength of the X-rays is tuned by choosing the right electron energy. The FLASH accelerator provides a range of electron energies between 350 MeV and 1.25 GeV covering a wavelength range between 52 and 4 nanometers (nm). See the table below for details. FLASH2 has new modern undulators with the possibility to change the gap between the magnetic poles of the undulator magnets. This changes the magnetic field and thus the wavelength of the radiation. With a given beam energy, the experiment at FLASH2 is able to change the wavelength in a wide range without influencing FLASH1. FLASH - Schematic layout of the facility. Schematic layout of FLASH. Not to scale. 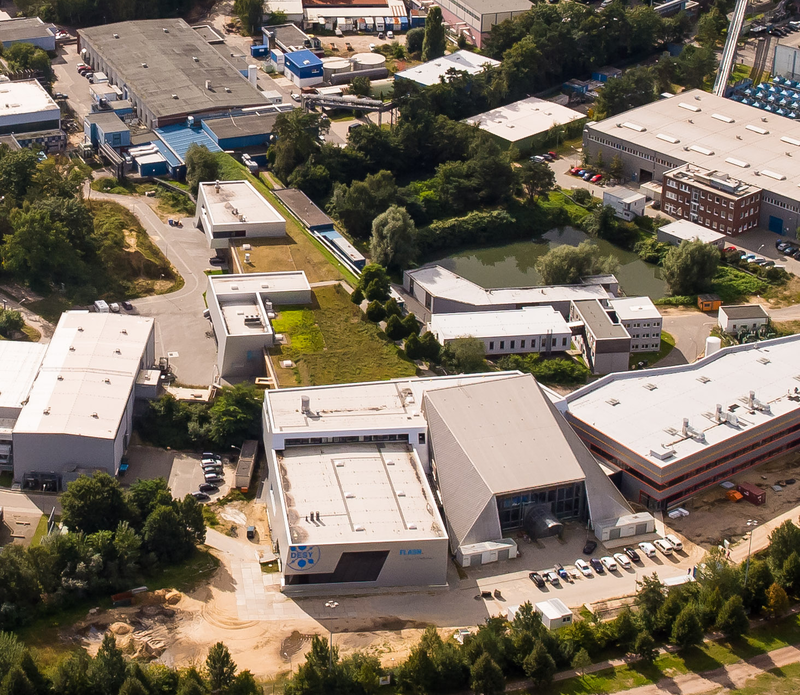 The two main SASE beamlines are in operation. A third beamline is under construction. It will house the FLASHForward plasma acceleration experiment. FLASH superconducting accelerating modules. 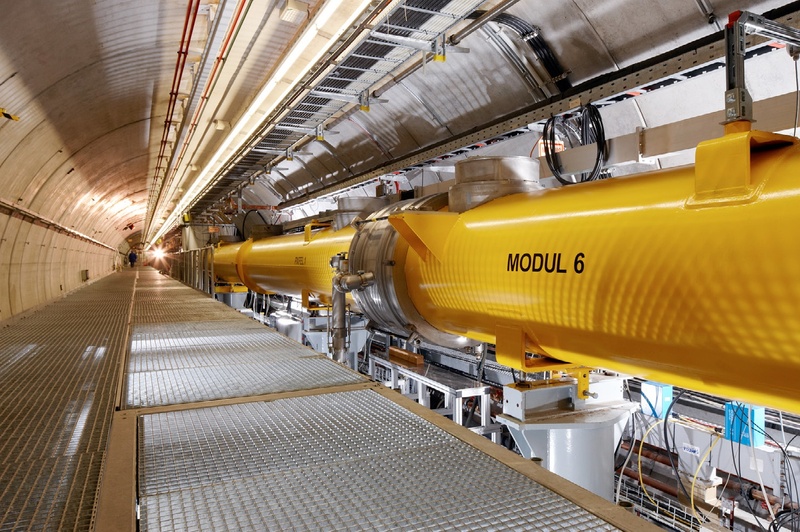 Seven modules are installed, each module has a length of 12 m.
The FLASH accelerator is equipped with seven 12 m long TESLA-type superconducting accelerating modules. Each module contains eight 1 meter long superconducting accelerating cavities operated a radio frequency of 1.3 GHz. The cavities are made of solid niobium and are cooled by liquid helium down to 2 K. At this temperature - just 2 degrees Celsius above the absolute zero -, niobium is superconducting so that the acceleration field can be applied with very small losses. This makes a superconducting accelerator very efficient. Right after the installation of the seventh module in 2010, the FLASH team accelerated an electron beam to an energy of 1.25 GeV. With this energy, soft X-rays with a fundamental wavelength of 4.1 nm could be produced. For the first time FLASH has generated soft X-ray FEL radiation in the so-called water window. So far this was only possible at FLASH with the third and fifth harmonic of the fundamental wavelength, which are by a factor of thousand fainter. The water window is a wavelength region between 2.3 and 4.4 nanometers. In the water window, water is transparent to light, i.e. it does not absorb FEL light. This opens up the possibility to investigate samples in an aqueous solution. This plays an important role especially for biological samples, because carbon atoms in these samples are highly opaque to the X-ray radiation, while the surrounding water is transparent and therefore not disturbing. Many scientific disciplines ranging from physics, chemistry, and biology to material sciences, geophysics, and medical diagnostics use the powerful soft X-ray source FLASH. The ultra-short X-ray pulses in the femtosecond range allow experiments which are not possible otherwise. For example, time-resolved observation of chemical reactions with atomic resolution, single shot diffraction imaging, and many others. More than 270 publications on FLASH photon science have been published already, many in high ranked journals. The unit for brilliance is B=photons/s/mrad2/mm2/0.1%bw. Note, that exact values depend on various conditions. Not all combinations within the parameter ranges given are possible. FLASH1 is equipped with an electro-magnetic undulator able to produce Terahertz (THz) radiation pulses. The THz pulses are produced by the same electron bunch than the SASE radiation. Therefore, both pulses, the soft X-ray and THz are perfectly synchronized (better than 5 femtoseconds). Parameters of the THz radiation at FLASH. Note, that the exact values depend on pulse length and wavelength chosen. FLASH1 has also a section equipped with variable gap undulators for seeding experiments (sFLASH). In April 2012, first seeding at 38 nm has been obtained. The seed source was radiation from high harmonic generation (HHG). An external femtosecond short laser pulse is focused into a gas cell producing higher harmonics of the laser wavelength. This radiation is overlapped with electron bunch and seeds the amplification process in the undulators. The advantage compared to SASE is the narrow bandwidth of the radiation pulses. This is advantageous for certain classes of experiments, where a small bandwidth is required. Today, the sFLASH experiment concentrates on HGHG, high-gain harmonic generation. bunches through a long undulator section. The lasing process is initiated by the spontaneous undulator radiation. The FEL works in the so-called Self-Amplified Spontaneous Emission (SASE) mode without needing an external input signal. The electron bunches are produced in a laser-driven photoinjector and accelerated by a superconducting linear accelerator. The RF-gun based photoinjector allows the generation of electron bunches with a tiny emittance - mandatory for an efficient SASE process.The superconducting technique allows to accelerate thousands of bunches per second, which is not easily possible with other technologies. At intermediate energies of 150 and 450 MeV the electron bunches are longitudinally compressed, thereby increasing the peak current from initially 50 to 80 A to 1 to 2 kA or more - as required for the SASE process to develop. FLASH1 has a 27 m long undulator made of permanent NdFeB magnets with a fixed gap of 12 mm, a period length of 27.3 mm and peak magnetic field of 0.47 Tesla (K=1.23). The electrons interact with the undulator field in such a way, that so called micro bunches are developed. These micro bunches radiate coherently and produce intense X-ray pulses. Finally, a dipole magnet deflects the electron beam safely into a dump, while the FEL radiation propagates to the experimental hall. An electron gains an energy of 1 electron volt (1 eV) moving across an electric potential difference of one volt (1 V). An every days battery has a voltage of 1.5 V.
One megaelecton volts (MeV) is a million volts; one gigaelecton volts (GeV) is a thousand million volts. Visible light is in the wavelength range between 380 and 760 nm. 1 nm is a millionth of 1 mm. The size of a molecules is about 1 nm.